Now available-- signed copies of the new paperback edition of SOMEDAY I'LL LAUGH ABOUT THIS. Pick yours up at Mari's Books And... next to the grocery store in Yachats, Oregon, the setting for this story. Our family cabin in the 1930s. My mother is the little girl sitting in the middle on the front step. Someday I'll Laugh About This is a book which began with a setting. I wanted to write about our little cabin in Yachats, Oregon, which has been in our family since my grandfather bought it during the Depression. So many good times have been logged there over the years. In writing about Shelby's problems of adolescence, I was actually remembering my own. My oldest son was only five at the time I was working on this and my twins were yet unborn. By the time they were all reaching Shelby's age, their stories were off limits for my books anyway! I name the town Perpetua in the book, but it's actually Yachats the way it used to be. The issue of the Historic 804 Trail forms a subplot in the book. It pleases me now that the trail is a done deal, and frequently mentioned as an attractive amenity for tourists. People probably don't realize how hard we had to fight to keep the trail open to the public when so many adjacent landowners wanted to close it off. Five-year-old cousin Brandon was based on my son, Miles. Here he's dressed for Halloween as Luke Skywalker with his glow-in-the-dark, plastic "I-Have-the-Power" light saber. Remember those? This was when Star Wars was popular the first time around. "Brandon" and his beautiful wife this past Halloween. He still has the power! 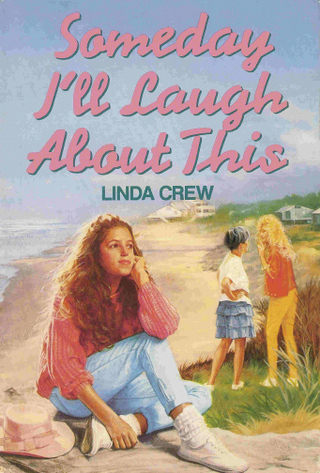 I call the cabin Sea Haven in the book, but the actual place has always been Ocean Crest. My mother made this sign when doing mosaic crafts was popular in the 60s. Another of my mother's projects, the infamous trout table, gets mentioned in the book. We used to joke that it was the only thing holding the cabin down in the high coastal winds.